Muon Detectors: When cosmic ray particles (usually protons) hit the upper atmosphere, a large shower of particles travels down to Earth’s surface at nearly the speed of light. The majority of particles that reach the surface are muons, high-energy charged particles that are easy to detect. The simplest muon detector is a Geiger counter, and the Beta detector units are based upon simple Geiger-Müller (G-M) detector tubes excited by several hundred volts of electrical charge. When a charged particle, such as a cosmic-ray-generated muon, passes through the G-M tube, a small spark occurs, generating an electrical signal that goes to the Timestamp Generator. Also being developed for ERGO are glass “resistive plate chamber” (RPC) detectors, which will gather many more high-energy particles and will be less sensitive to natural background radiation from Earth. 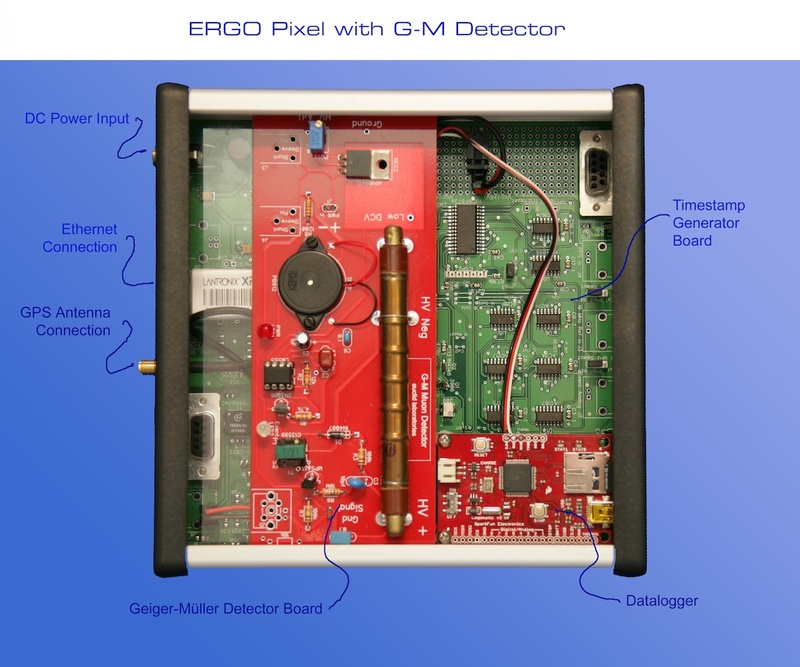 RPC detectors operate at much higher voltage and are not commercially available, so the ERGO project is hoping to develop a suitable detector for its use. These detectors will detect fewer counts of Earth-based background radiation (such as those resulting from radon in the air) and their larger area will increase the likelihood of detecting the cosmic-ray muons of interest. 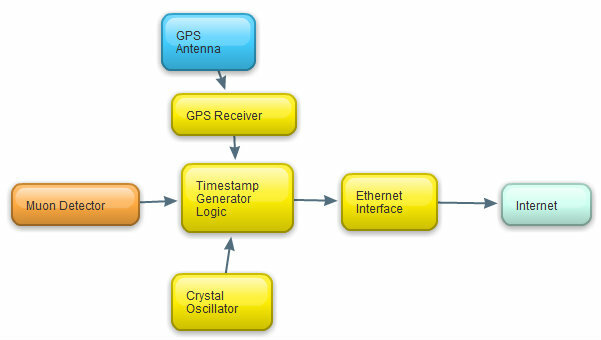 GPS Receiver: In order to provide high resolution in position and time, each Timestamp Generator contains a GPS receiver that determines the unit’s location and provides a very precise time reference from the GPS satellite system. 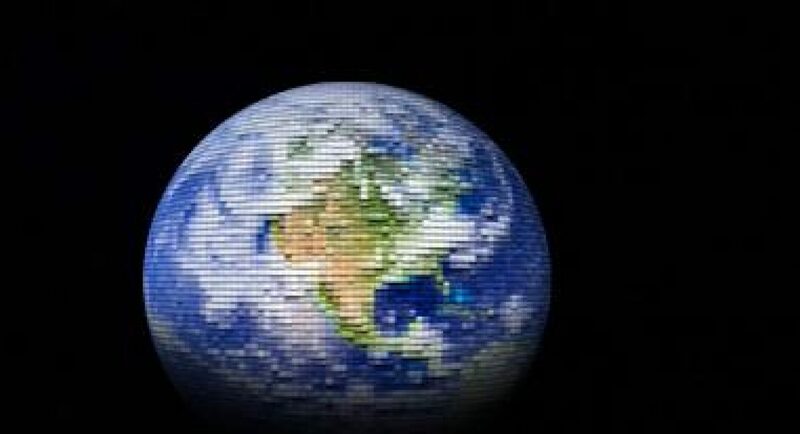 Internet Connection: Once an event is detected and a timestamp generated, a miniature Ethernet server within the Timestamp Generator uploads the timestamp to the central database server by way of an cable connected to the LAN at the site where the system is located. The only outside resources that the participating organizations need to supply are power and a LAN connection with internet connectivity.